What are types of featured snippets? What are some featured snippet examples? 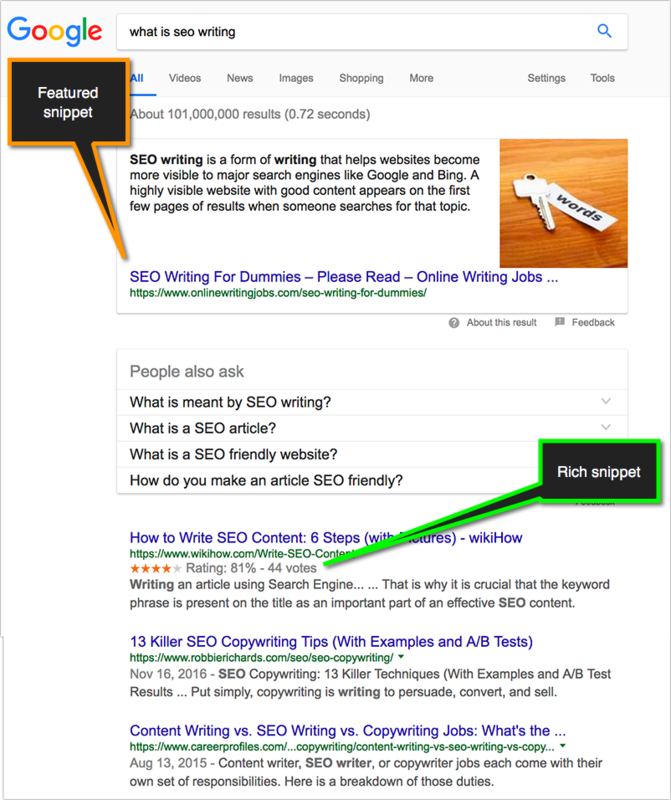 Featured snippets vs. rich snippets: How are these two different? Featured snippets vs. answer boxes: Are these the same? Is there some type of specific featured snippets code? How do you optimize for featured snippets? Is Google the only search engine that features certain search results? How do you get featured snippets in search? Do featured snippets drive more clicks? How many queries show featured snippets? What is "people also ask"? How does the Featured Snippet Optimization Tool use "people also ask" data? What is "searches related to"? How does the Featured Snippet Optimization Tool use "searches related to" data? How does the Featured Snippet Optimization Tool work? Where does your snippet data come from? What exactly is Ninja Value? What does the Featured Snippet Optimization Tool guarantee me? Can I get a refund or a partial refund? Can I run this tool on my competitors? Does this tool publish edits on my site live? Is there an API for this tool? When should I re-run the tool? How can I tell if my edited content now has featured snippets or not? Can I measure the results? The links below are excellent resources to learn about Google’s featured snippets and how to optimize your content to get more featured snippets for your pages. 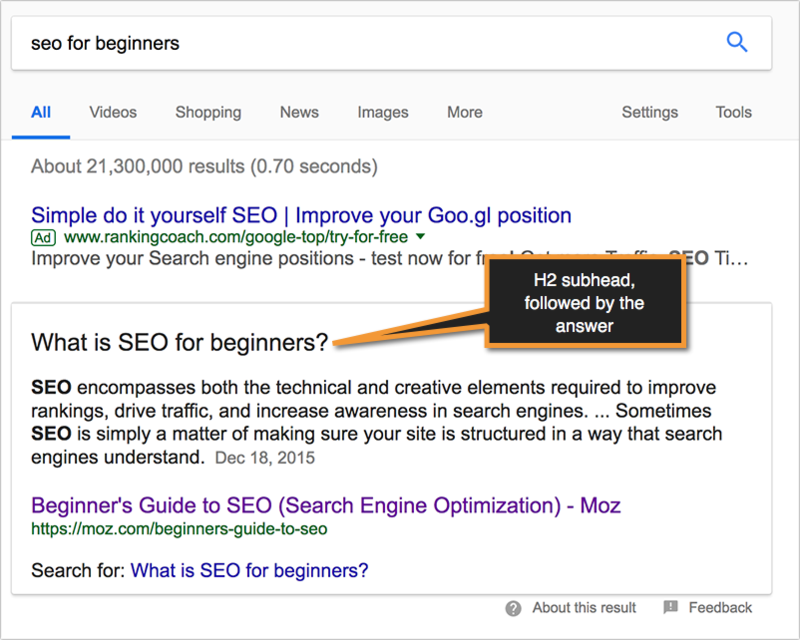 Ann breaks down the process of creating featured snippets in this post at Moz. You’ll learn more about identifying opportunities and how to create content that is more likely to become a featured snippet. Ann’s guide will walk you through collecting featured snippet data and research and applying that data to your pages. By Ann Smarty @ Moz. Ann answers all of the essential featured snippet questions in this FAQ she wrote for the Content Marketing Institute. If you have questions about adding photos to your snippet, which snippets to target, and how snippets will affect your rankings, you will find the answers here. If you want to know how to get a featured snippet, Ann’s slideshow will guide you through every step of the process. You’ll learn how to best use keyword phrases, create optimized headings, and more. There are plenty of screenshots and examples to guide you through the process. If you had any doubt about the importance of featured snippets, this data, compiled by Ann in a post for Search Engine People, will clear it up. Featured snippets are taking clicks away from the #1 result, and 41% of question queries have featured snippets, which means that your site is probably full of opportunities. By Ann Smarty on Search Engine People. It may sound too good to be true, but it’s completely possible to secure position zero with successful featured snippet optimization. Find out what happens to traffic when you get a featured snippet, and learn more about how to get there. This guide provides plenty of details and step-by-step instructions. By Ann Smarty at Marketing Profs. What? You Are Not Optimizing for Google’s Featured Snippets Yet? Here’s What You Should Do! A featured snippet is a box of information Google places on top of the organic search results in an effort to quickly answer the search query. Google has introduced featured snippets to better serve mobile and voice users (featured snippets are being read when a person is using voice to search). Featured snippets are also referred to as position 0. Paragraph featured snippet: The answer is being given in one paragraph, usually about two short sentences. List featured snippet: The answer is being given in a form of a list. These usually appear for queries that imply any type of enumeration (e.g. different types, products, steps, etc.). Table featured snippet: The answer is being given in a form of a table. 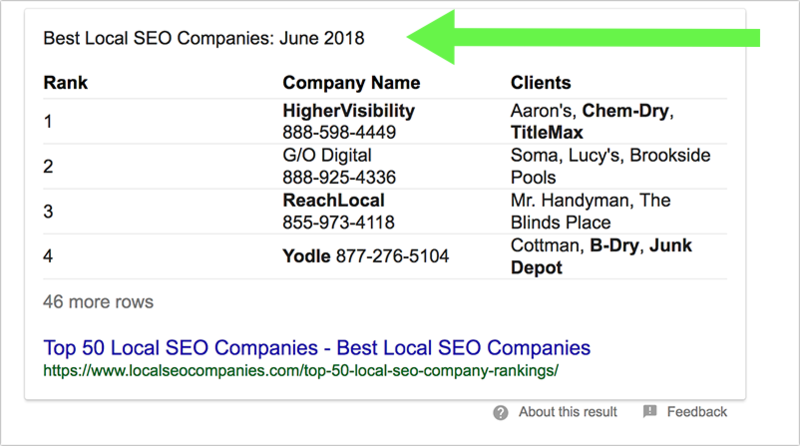 A table featured snippet is Google's preferred way to answer queries that imply comparison and/or a summary of numbers. Each of the above snippet types may have an image that shows up next to the text. 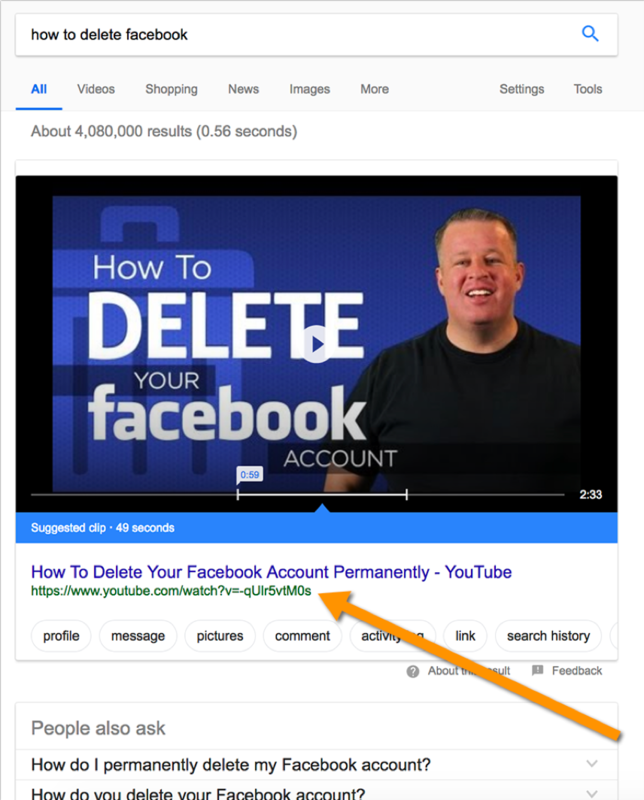 The fourth type of featured snippet is a video featured snippet, i.e., when a user can play a video right away. These are usually sourced from YouTube. Featured snippets are search results appearing on top of the organic search results. Google picks the result giving the best and most concise answer from their own top 10 results and shows the chosen page in position 0. Rich snippets are regular search results that generate "prettier", enriched listings. For example, these search results may show star ratings or a video thumbnail. These are usually formed from on-page Schema.org structured data implementation. An "answer box" refers to a section of a search result page that gives a quick answer to a query. Usually, this answer eliminates the need to click, and it never references the source. A featured snippet refers to a section of search result page that references a page that gives the most useful and concise answer to a query. This one is more important to us because unlike answer boxes, featured snippets provide additional exposure to featured pages. There's no specific code that will get you featured in Google. There's no magic bullet, and there's no way to guarantee that something will get you featured, just like there's no way to guarantee top organic Google rankings in general. 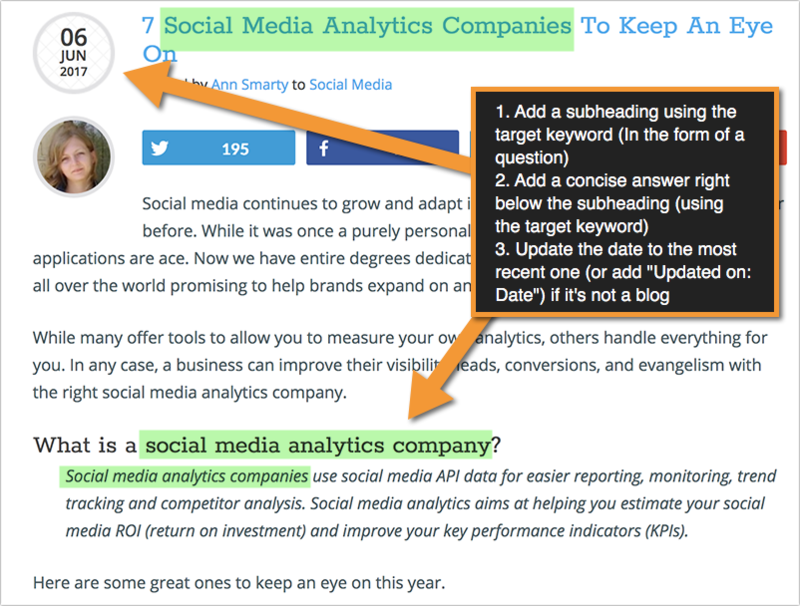 Start with queries where you already rank in the top 5 organically. Put the search query in the question format in the <h2> subheading ("<h2>...?</h2>"). Add a quick answer to the question right below the heading. Add a search-optimized image right next to the heading (a search-optimized image has keywords in the file name and alt text). If applicable, update the article's publication date. Look at the currently featured result for some more ideas. 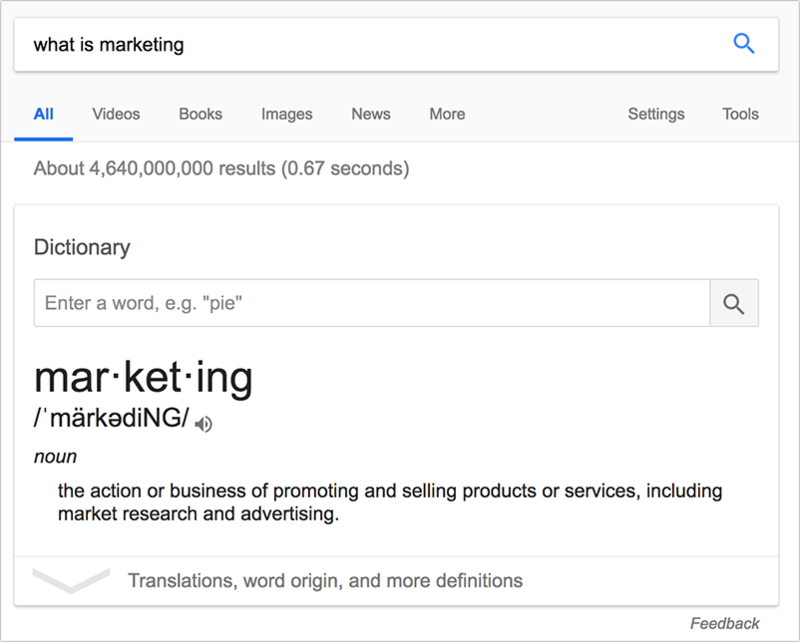 Bing also has featured snippets that work very similarly to Google's. 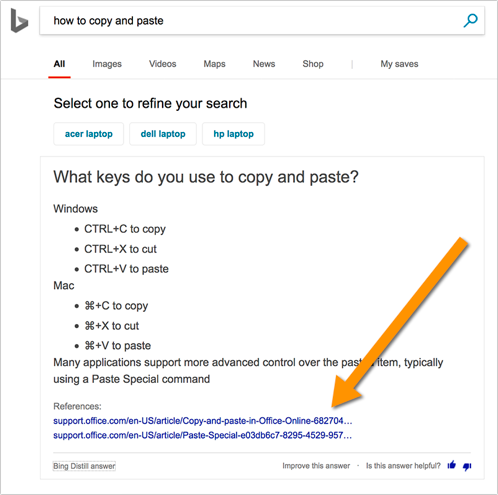 Bing may feature two URLs, and they often pick snippets farther down the page than Google. 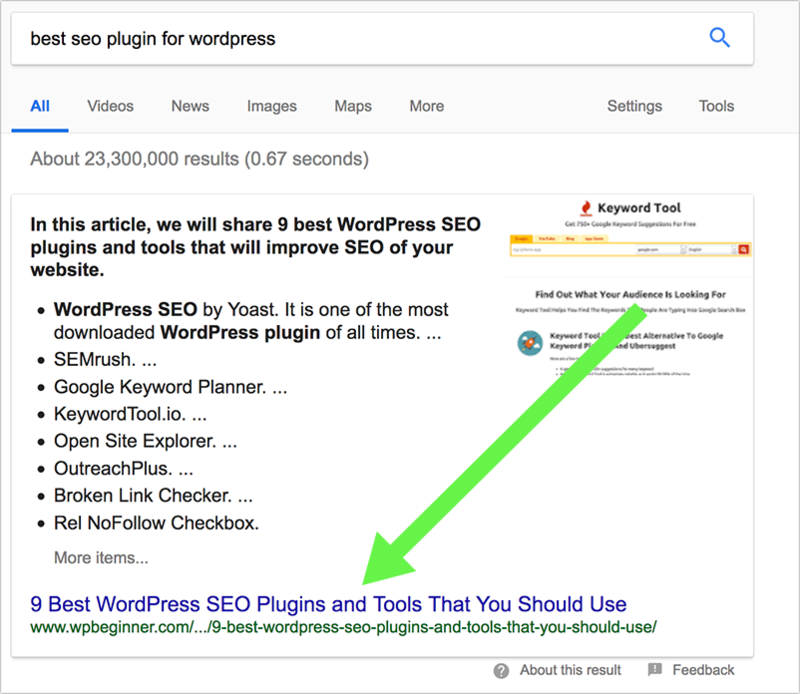 Both Google and Bing keep emphasizing one featured snippet optimization tactic: To get featured, give the best possible answer to the user's query. Research your competitors' featured rankings. 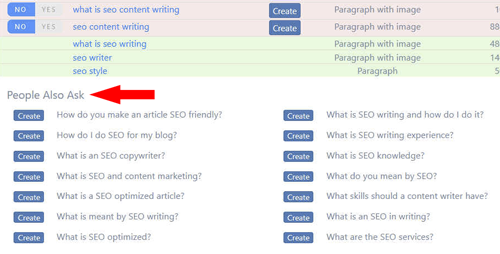 Brainstorm content that can best answer niche questions (1) and will do a better job than that of your competitor (2). Optimize one solid, long-form content asset for many related queries to get it to rank for more featured snippets. In most cases, yes. In multiple case studies, the numbers have varied from a 10% to 30% increase in click-through rates from search results once a page gets featured. Featured snippets drive more brand awareness. With brand awareness comes more conversions. More than 50% of question-type queries trigger featured snippets. Around 30% of comparison-type queries trigger featured snippets. Featured snippets are still volatile (Google keeps tweaking the algorithm on a regular basis), so these numbers are going to change as Google gets better at identifying the best answers to queries. Researching featured snippets' opportunities lets you discover more queries to optimize for. Researching competitors' featured snippets lets you find more content opportunities. Creating content to get featured makes your site more useful for the user, which brings higher rankings and better conversions. When you search for a phrase in Google, often, on the results page, there is a section called "People also ask." Usually, four or five of these questions will be shown, and if you click on any question, you will get a drop-down with more information. That information is similar to how Google shows data for featured snippets. Below is a drop-down "answer" to a "people also ask" question. When we gather ranking data on your keywords, we also collect any "people also ask" questions in the search results for those phrases. This data can be found in its own People Also Ask report, which shows the number of times each question was found when we gathered data on your keyword queries. 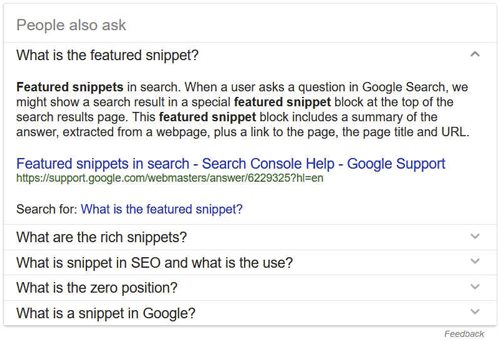 We also add these questions in your Featured Snippet Optimization Tool results because if you search for those questions in Google, there are featured snippets for the vast majority of them. Often, when you search in Google, on the bottom of the results page, there is a section called "Searches Related to [phrase you searched]." When we gather ranking data on your keywords, we also collect any "searches related to" phrases found in the search results for those phrases. This data can be found in its own Searches Related To report, which shows the number of times each phrase was found when we gathered data on your keyword queries. We also add these phrases into your Featured Snippet Optimization Tool results because they often have featured snippets (not as many as the "people also ask" phrases, but still often), plus it is good to know related phrases that might be good to include on your pages. When you enter in your domain and start a domain-level run, we collect a list of up to 5,000 keyword phrases that you rank in the top 15 for. We then group these keyword phrases by URL and apply some custom filtering, limiting each URL to the best 80 keyword phrases that it ranks for. This is done to help focus your efforts on the most valuable keyword phrases. Once we have a pared-down list of valuable keyword phrases grouped by URL, we sort the URLs by page value, ensuring that when you load the report, the most valuable pages and keyword phrases will be seen first. This part of the process is highly dependent on how well your site ranks in Google. If your domain does not rank in the top 15 for very many keyword phrases, it will be difficult to be successful in capturing featured snippets. Instead of doing a domain-level run, you can instead input a list of URLs; the tool will then collect keyword phrase data for these pages instead of the entire domain. We collect data from third parties. Due to the frequency in updates to the structure of the data, our system requires frequent maintenance to ensure that we are providing the most accurate data possible. The Ninja Value is the monthly estimated value of a URL or keyword phrase, with the assumption that the referenced URL ranks #1 for that phrase. When a Ninja Value is provided for a URL, it assumes a #1 ranking for all of the keyword phrases that that URL ranks for. Frequently, a URL will not actually rank #1 for all keyword phrases, but the Ninja Value can be a potential guide to the value of a URL. The parameters used in calculating Ninja Value are the CPC of each keyword phrase, the search volume of the keyword phrase, and the approximate click-through rate for a #1 ranking. This tool does not guarantee you anything at all. It doesn’t guarantee your rankings, and it doesn’t guarantee that you will get featured snippets. If this tool is used properly and the Google Gods are with you, you can analyze and optimize for phrases and obtain many new featured snippet placements, but there is no guarantee of anything. Sorry, but no, you can’t. But feel free to use up credits on any sites you want to analyze. Yes; currently, it basically does this. After the keywords that you rank in the top 15 have been chosen, anyone who has featured snippets for these terms is your competitor. Our tool will show you a summary of your biggest competitors at the top. You can run a competitor’s site through this tool, but it probably won’t be as helpful because you need to analyze phrases for which you currently rank in the top 15. Analyzing anything else isn’t likely to be worth your time. No, it doesn’t. You can make edits in the tool, and you can send those edits to the person who updates the content on your site. The “Optimized Snippets” tab and the HTML export option make it easier for your team to edit or add to the existing content, but the final step is still a manual process. Maybe in the future, we can make this a WordPress plugin, but not today. When we gather data for each of your URLs, we only gather phrases for which where you rank in the top 15 in Google. There’s a 98% chance that the keyword you think you’re “missing” is one that you don’t rank in the top 15 for. If you’re not in the top 15, your odds of obtaining the featured snippet are around zero, which is why we don’t show you these phrases. If later on, you rank in the top 15 for that phrase, we’ll show that data then. No; we see no need for one. Just use the tool here. We recommend you re-run it a month after the new/edited content has been published. Re-run the tool about a month after publishing your new/edited content. When the tool is re-run, you will see additional stats on the top of the page showing changes from the last time that the tool was run so you can see the differences. Each time the tool is re-run, additional stats will be pulled in. The Featured Snippet Optimization Tool is a product of Ninja Tools which is a division of Internet Marketing Ninjas, which is owned by Jim Boykin.